This is because the feet, hands, elbows and knees are used in this devastating ring sport. It is known for its cardiovascular training as well as it's take no prisoners attitude. The pao or thai pads are used to develop the penetrating knees and kicks and the banana bag is used to condition the shins to their legendary thoughness. Philip Gelinas began his Muay Thai training under Tom Harinck Jr of the Chakuriki school in 1985. He receive his basic level instructorship from them in the World Muay Thai Association. Distance made training with them impossible and Philip began his training under Ajarn "Chai" Sirsute receiving his basic instructor level in 1992. 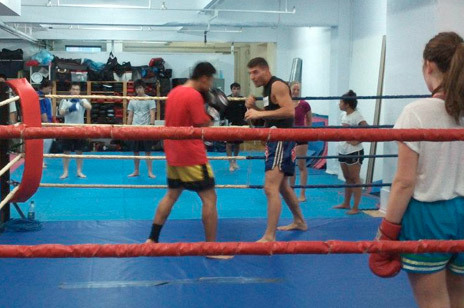 Muay Thai classes are taught by Philip Gelinas and Martin Foisy. Each one offers a slightly different flavor, but all focus on strong technique and excellent conditioning. Check the schedule for class times. Different people train for different reasons. Some are looking for the amazing workout that Muay Thai training offers. Others want to learn the basics of Muay Thai fighting. Some have a desire to compete. Our Muay Thai program can accomodate all of those people and more, from the complete beginner to the professional fighter. We provide all the equipment, such as Thai pads, focus mitts, kicking shields, skipping ropes, punching bags...we'll even lend you a pair of gloves your first couple times out. Come try a free class and find out what this art is all about. If you have Muay Thai or striking experience, come try our Advanced Muay Thai Program, where Kru Martin Foisy will put you through some of his grueling conditioning and hard-hitting Muay Thai style.